In DMVPN phase 1 we saw that there is no direct Spoke – Spoke communication. In phase 2 there will be a multipoint GRE tunnel interface on the spokes as well instead of point-point GRE tunnel. So we have direct spoke-spoke tunneling in phase 2. 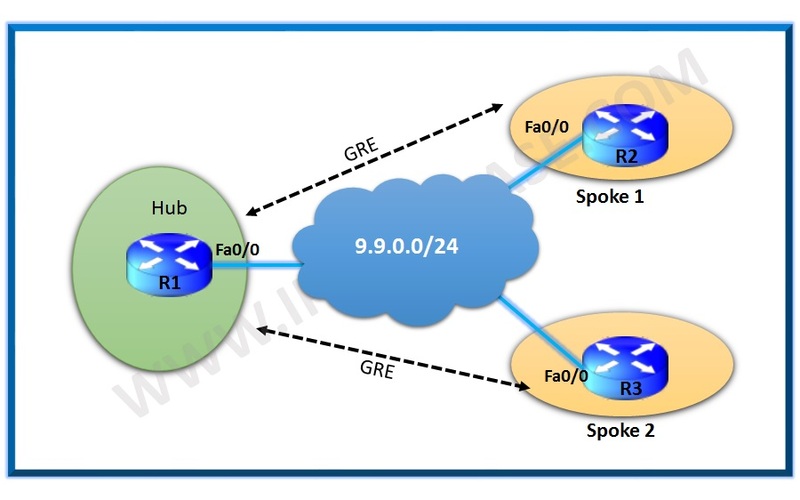 When a spoke router wants to reach to another spoke router it will send out a NHRP resolution request to HUB to find the NBMA address of the other spoke. Now the Spokes will have Multipoint GRE tunnel interface. There will be no manual destination configured on the spokes. The first packet from spoke to spoke will traverse the hub after which we will see a dynamic tunnel created towards the spoke and the packet there onwards will reach directly the Spoke. no ip next-hop-self eigrp 100 #So that hub doesn’t list itself as the next hops for the routing updates of the spoke. On spokes we see only a single tunnel created towards the Hub. The routing table on R2 shows the route for R3 is learnt directly via the R3 and vice versa. Next we see a Dynamic tunnel gets created between Spoke 1 and Spoke 2.